Mars is the obvious next staging post for mankind's exploration of the solar system - it's only 140 million miles away after all - and there's more than one agency busy arranging trips to the planet. Here we'll run through some of the most high-profile planned missions. And all of these missions are still at the planning stages, so it's going to be some time yet before any of them are given confirmed dates. It's still not clear who's going to be the first to make it to Mars with a human crew, but it might happen sooner than you think. NASA continues to confirm its commitment to organising a manned mission to Mars, although there's nothing specific in the calendar just yet - the agency says it hopes to have humans in orbit around the Red Planet by the early 2030s. Before that happens, several missions will take place somewhere closer to home but beyond the orbit of the moon, to try and give astronauts a chance to adapt to being further away from Earth (and to give scientists more of an opportunity to monitor how deep space living affects our minds and bodies). NASA is upgrading its hardware in preparation for a manned Mars mission: the Space Launch System (SLS) will enable us to get rockets deeper into space than ever before, while the Orion spacecraft, still in development, is going to be the spacecraft that will eventually carry people to Mars. Before we can land though, we need to know much more about the surface and the environment of the planet, and to that end NASA is launching another rover mission in 2020. The robot explorer will be based on the Curiosity rover that's already on the surface of Mars, but with a more advanced stack of scientific instruments. Landing on the surface in February 2021, the new rover will be able to deal with a wider range of terrain and take more detailed measurements. One of the buggy's main objectives will be to assess what humans are going to need to be able to survive on Mars, setting the foundations for Orion's eventual arrival a decade later. While there are tentative plans for a new NASA orbiter to make its way to Mars in 2022, nothing has been decided yet. Again, the purpose of the spacecraft would be to gather as much data as possible before humans make the trip. SpaceX CEO Elon Musk has made no secret of his plans to colonise Mars, but just like NASA the company has to wait for the technology to catch up with the vision. 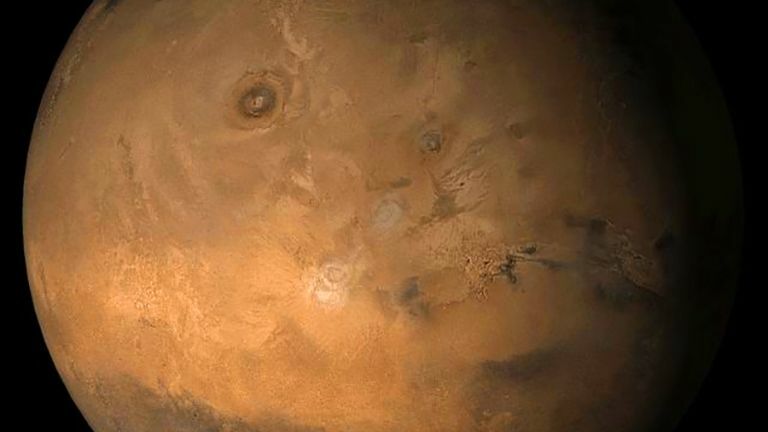 The plans on the drawing board are very ambitious though - SpaceX has said it wants to get a million-strong Mars colony on the surface of the Red Planet with the next century. Engineers are currently working on the Interplanetary Transport System (ITS), designed to carry astronauts much deeper into space than ever before, with a capacity capable of carrying 100 people at a time. While the roadmap continues to be tweaked, the bulk of the ITS could be built and ready to carry people as soon as 2024. A lot of the technology SpaceX is working on, including rocket boosters that can return to Earth and refuel, will eventually find a use in the Interplanetary Transport System. The designs are still being worked on at SpaceX, but the early indications are that the spacecraft are going to be at least as impressive as anything NASA is working on. What's perhaps even more interesting is what Elon Musk and SpaceX plan to do when we finally arrive on Mars (ticket prices are expected to be around $200,000 per person, by the way). The ambitious CEO has talked about terraforming the planet - artificially modifying the atmosphere to be more like Earth's - as well as farming methane from the atmosphere to power return trips. Details on this and much of the rest of what SpaceX is planning are still thin on the ground, but Elon Musk hasn't left anyone in any doubt about how risky the trip is going to be for the first few travellers - in fact he says he himself won't be one of the first humans to see Mars because the chance of ever making it back is so low. Testing for Mars-ready systems is going to begin in the next couple of years, SpaceX says, as the company looks to scale up its existing technologies to get us to the Red Planet. Aside from the official government-backed space agencies around the world, it's definitely the organisation to watch as far as Mars exploration goes. While other space agencies and private companies have tentative plans to reach Mars one day - the European Space Agency is planning to send a rover to the planet in 2020, for example - the only other stated plans to get people to Mars that we know about at the moment come from private outfit Mars One. Whether those plans will actually become a reality remains to be seen. Mars One certainly doesn't have the same kind of history behind it or the same high profile as SpaceX, but its plans are nevertheless very ambitious. The company wants to have its first human crew setting off for Mars in 2031 and doesn't expect them to return - this is very much a one-way mission for the first astronauts. Making the trip one-way significantly reduces the costs of a Mars mission and means the whole operation can be sped up, although there have been questions asked over whether Mars One is actually a viable operation in terms of its finances and its technology - the backers of the project want to fund everything by securing private investment and earning money from broadcasting rights. There are plenty of missions on the Mars One roadmap, including a demonstration test in 2022, a rover mission in 2026 to do some exploratory work, and a cargo mission currently scheduled for 2029. As with the other missions we've mentioned, there's a lot of groundwork to do (literally in some cases) before astronauts can set off. And that astronaut selection process is another interesting aspect of the Mars One project - it's going to be turned into a kind of TV event according to the latest plans, with interested volunteers being asked to work through a series of physical and mental challenges to make the final shortlist. After the first crew is chosen, an intensive training regime will begin. Unfortunately, at this stage it's not altogether clear whether the grand plans that the Mars One team has are going to be realised, with problems reported around funding and technology. At least the project has added to the conversation about getting humans to the Red Planet - and produced some very cool-looking concept art along the way.